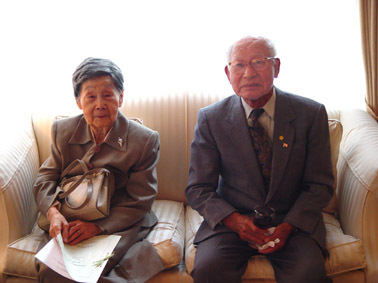 Mr. Shozo Ishikawa and his wife, Hiro. 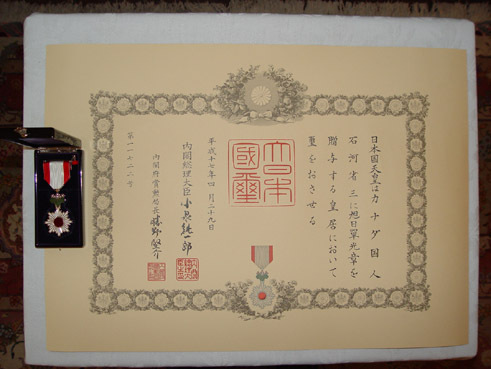 A 90 year-old Japanese Canadian, who has devoted his life to the welfare of his community, was conferred The Order of the Rising Sun, Silver Rays for his work from His Majesty, Emperor Akihito. 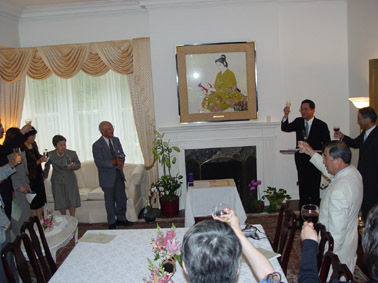 A special presentation ceremony was held on June 15 at the official residence of Consul-General of Japan Hisao Yamaguchi. Shozo Ishikawa was born in Shiga Prefecture in 1915 and moved to Vancouver in 1935. 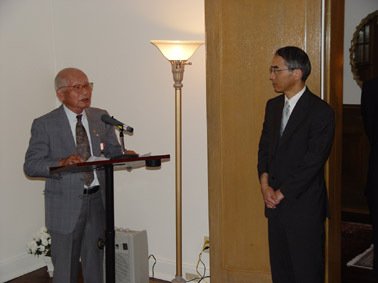 Since arriving in Toronto in 1949, Mr. Ishikawa devoted himself to the betterment of life for Japanese Canadians through his work in the Toronto Japanese Canadian Citizens Association's Issei Division, serving in various executive positions including its President. (Issei refers to first generation immigrants.) Other volunteer positions he has filled include board member of the Japanese Canadian Cultural Centre, and founding President of Toronto Shiga Kenjin-Kai (an association of Japanese from Shiga Prefecture). 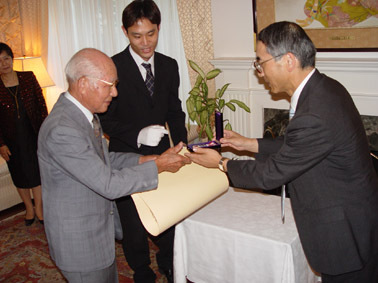 In 1995 he was a recipient of the Ontario Volunteer Service Award, and in 2000 Mr. Ishikawa received a Special Commendation from the Consul-General of Japan for his work. Mr. Ishikawa recieves his conferment from Consul-General of Japan Hisao Yamaguchi, and immediately afterwards expresses his appreciation. "Today, Japanese Canadians are esteemed by Canadian society as a whole. I believe that tourists from Japan and recent Japanese immigrants to this country benefit greatly from this," Consul-General Yamaguchi said in presenting the Order to Mr. Ishikawa. "The issei, starting with Mr. Ishikawa, overcame unimaginable difficulties to promote the development of the Japanese Canadian community." "Whenever I have the opportunity to meet with Mr. Ishikawa, I always feel that he is what it means to be a good Japanese," he added, "I would like to wish him continued success and good health in the future." (Right) Mr. and Mrs. Ishikawa relax after the ceremony. After the presentation, Masaaki Murakami, President and CEO of Mitsui & Co. and Vice President of the Toronto Japanese Association of Commerce and Industry (Shokokai), led the attending guests in raising a toast to Mr. Ishikawa. In his remarks, Mr. Murakami also credited Mr. Ishikawa and the issei for garnering trust and respect for Japanese Canadian community which is beneficial to Japanese businesses as well. 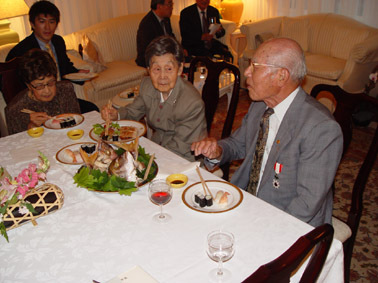 Afterwards, friends and family of Mr. Ishikawa celebrated the occasion over dinner hosted by the Consul-General.